Photograph:©James Bynum. Used with Permission. The land of Utah covers 85,000 square miles, and is home to some of the most spectacular and unique natural formations in the country. 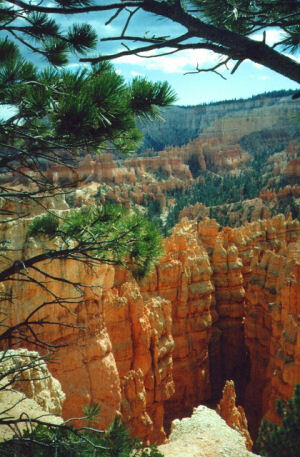 Some of these unique sites have been designated national parks -- Famous among them are Zion National Park with its natural monuments, the towers and spires of Bryce Canyon, and the spectacular red rock of the Canyon Lands. Natural bridges, gorgeous canyons, and mysterious moonscapes are all part of Utah's landscape. And the mountains of Utah offer great skiing and a great place for the 2002 Winter Olympics. Visit the site of the 2002 Winter Olympics in Salt Lake City, Utah. 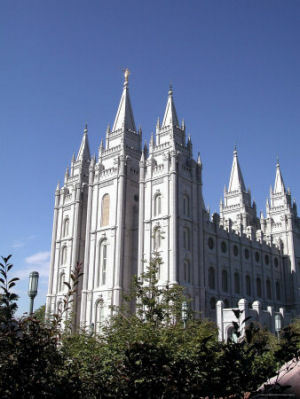 Most of the nicknames associated with Utah are related to the members of The Church of Jesus Christ of Latter-day Saints, or Mormons, that first settled in the territory. Deseret, in The Book of Mormon is actually a honeybee. Early Mormon settlers have been described as having carried "swarms of bees" with them. This nickname commemorates the industry of the people of Utah. The beehive was adopted, in 1847, as an official emblem and represents the qualities of industry, perseverance, thrift, stability, and self-reliance, all virtues respected by the region's settlers. The beehive is the centerpiece of the Utah State Flag and the Utah State Seal. When the Mormons first came to the territory, they named the area The State of Deseret, a reference to the honeybee in The Book of Mormon . This name was the official name of the colony from 1849 to 1850. The nickname, "The Deseret State," is in reference to Utah's original name. This term is another reference to the early settlers and their influence in the state. This is the only non-Mormon nickname of the group and, of course, refers to The Great Salt Lake. People who live in Utah or who come from Utah are called Utahns. The fifth and final commemorative quarter-dollar coin released in 2007 honors Utah, and is the 45th coin in the United States Mint's 50 State Quarters® Program. 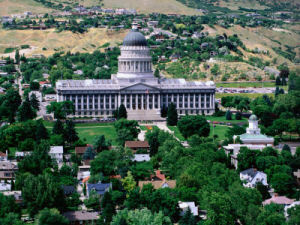 Utah was admitted into the Union on January 4, 1896, becoming our Nation's 45th state. The reverse of Utah's quarter features two locomotives moving toward the golden spike that joined the Central Pacific and Union Pacific railroads, linking East to West and transforming both the Utah Territory and the Nation with the inscription "Crossroads of the West." The coin also bears the inscriptions "Utah" and "1896." On May 10, 1869, two steam locomotives met at Promontory, Utah, for the "Joining of the Rails Ceremony," at which the Union Pacific and Central Pacific railroads completed the transcontinental route. The event was crucial to the development of the American West because it made cross-country travel more convenient and economical. The construction of the railroad, and the subsequent mining boom, brought diverse ethnic and religious populations to Utah. The railroad also symbolized the changing technology, and moved Utah from an agrarian economy to a more industrialized one. Even before the time of steam locomotives, Utah experienced a steady flow of explorers and pioneers. The Spaniards first came to explore Utah in the 18th century and were followed by mountain men, Mormons and prospectors in search of precious metals found in the 1860s. Because of its central location, Utah became known as the "Crossroads of the West." The Utah Commemorative Quarter Commission invited narrative submissions from the citizens of Utah. The Commission received approximately 5,000 submissions and recommended three concepts to the United States Mint for rendering by the United States Mint sculptor-engravers and artists in the United States Mint's Artistic Infusion Program. More than 150,000 citizens voted in a 25-day statewide vote in April 2006. "Crossroads of the West" prevailed as the favorite design among voters. Governor Jon M. Huntsman, Jr., announced the State's recommendation at the Golden Spike National Historic Site in Promontory on May 10, 2006, the 137th anniversary of the Joining of the Rails. The Department of the Treasury approved the design on June 22, 2006. The two other design concepts considered were the "Beehive," featuring a beehive, part of the official seal and State emblem of Utah, symbolizing industry and working together for common purposes, and "Winter Sports," featuring a female snow boarder and celebrating Utah as a world-class winter sport destination and the site of the 2002 Winter Olympics. Utah (From Sea to Shining Sea) , by P.J. Neri. 80 pages. Publisher: Scholastic Library Publishing (October 2002) Reading level: Grades 3-5. Presents information about Utah's people, geography, history, landmarks, natural resources, government, state capitol, towns and cities, and more. Utah (World Almanac Library of the States) , by Kris Hirschmann. 48 pages. Gareth Stevens Publishing (January 2003) Reading level: Grades 4-6. Filled with the most up-to-date information, including the latest Census results. Full-color photos bring to life the story of Utah. In addition to an in-depth factual profile of Utah in the form of a state Almanac, this book offers fascinating and lively discussions of the state's history, people, geography, government, economy, culture, and lifestyles. A section on Notable People, a calendar of events, and enough primary source documents, time lines, maps, and other tools to make this unquestionably the best young adult reference material on the USA available anywhere. Utah: A People's History , by Dean L. May. 228 pages. Publisher: University of Utah Press (January 7, 2002) History belongs to the people, Dean May reminds us, and must ultimately be accessible all. Based on his award-winning television series, Utah: A People's History provides a sweeping view of the state's past. From prehistory to present, May explains Utah as it is today and its promise for the future. Roadside History of Utah , by Cynthia Larsen Bennett. 401 pages. Publisher: Mountain Press Publishing Company; 1st edition (June 1, 1999) Divided into eight geographical-historical sections, Roadside History of Utah takes readers on a journey through time as it follows the state's highways, vividly portraying the determined people who faced the challenges of making a home in Utah. Readers will meet them all: the native peoples, early explorers and traders, Mormon pioneers, miners and ranchers, and even today's developers. In addition to detailing the state's major historical events, author Cindy Bennett displays a love of Utah that casts a warm glow on her accounts of tiny settlements taking root and growing into amiable towns like Pleasant Grove, whose main landmark today is a hamburger joint called the Purple Turtle, and Richmond, home of Utah's first evaporated-milk factory. Bennett relates stories such as the terror of Bear Lake, where for years a 75-foot monster was believed to lurk until it was discovered that the disturbance in the water were caused by local cattle. These, and many more tales, are the compelling stories of Utah's exceptional people. Anyone traveling through Utah's gorgeous landscape will be captivated by Roadside History of Utah's historical tales and insightful commentary.